Herbert Marcuse, Erich Fromm, Max Horkheimer, Franz Neumann, Theodor Adorno, Leo Lowenthal—the impact of the Frankfurt School on the sociological, political, and cultural thought of the twentieth century has been profound. 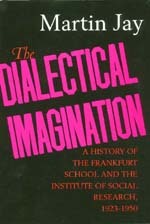 The Dialectical Imagination is a major history of this monumental cultural and intellectual enterprise during its early years in Germany and in the United States. Martin Jay has provided a substantial new preface for this edition, in which he reflects on the continuing relevance of the work of the Frankfurt School. Martin Jay is Sidney Hellman Ehrman Professor of History at the University of California, Berkeley. Among his books are Downcast Eyes: The Denigration of Vision in Twentieth-Century French Thought and, as co-editor, The Weimar Sourcebook, both published by the University of California Press.